After attempting to illegally cross the United States border from Mexico, Armando (Edwin Perez) awakens bound in an unknown place with a burlap luchador mask sewn to his face. A sadistic family with hungry eyes holds him captive with his only chance of escape to compete in a Lucha Libre match and defeat the most terrifying luchador of all El Gigante. El Gigante is an action packed 12 minute thrill ride from Luchagore Productions that shouldn’t be missed. Wrestling and horror fan alike will take to this gritty underground, backyard wrestling where losing a match may mean your death. There’s more on the line than a championship belt when you face El Gigante, a loss may mean you’re somebodies next meal. It is rare that I review a short film, even rarer that I review one under fifteen minutes just because there’s so little one can write about without giving away the entire short. Co-Directors Gigi Saul Guerrero and Luke Bramley's Luchagore interpretation is one worthy of getting the word out about. When it ended I wanted more and there’s so much more to be had. Based on the alike titled book, Luchagore Productions brings us a taste of the bloody Lucha Libre action a fully funded feature would fulfill. 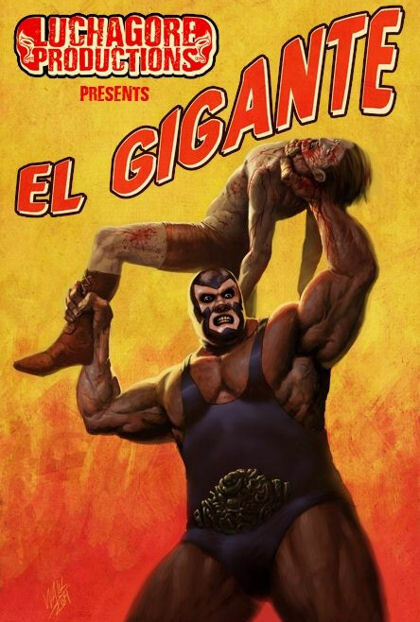 It’s rare that I give a five head review and I never thought I’d give one to a short but with a few more minutes El Gigante might have got it.